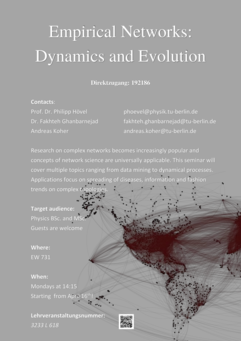 Research on complex systems becomes increasingly popular and concepts of network science are universally applicable. This seminar will cover multiple topics ranging from data mining to dynamical processes. Applications focus on spreading of diseases, neuroscience, information and fashion trends on complex topologies. The poster announcement can be downloaded here: poster_ws17. The assignment will be done during the first seminar on October 16, 2017.